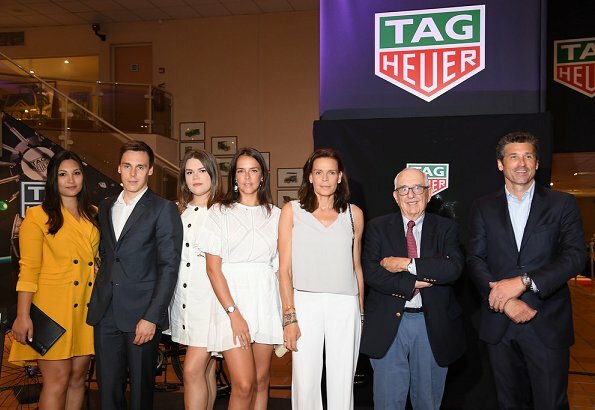 Princess Stéphanie of Monaco, Camille Gottlieb, Pauline Ducruet, Louis Ducruet and his fiancee Marie Chevallier visited the Monaco Top Cars Collection Museum to celebrate the launch of the TAG Heuer Monaco Gulf Limited Edition 50th Anniversary. The Monaco Top Cars Collection (or the Exhibition of HSH The Prince of Monaco's Vintage Car Collection) is an automobile museum in the Fontvieille district of Monaco. Why does she look so terrified in most of the pictures? 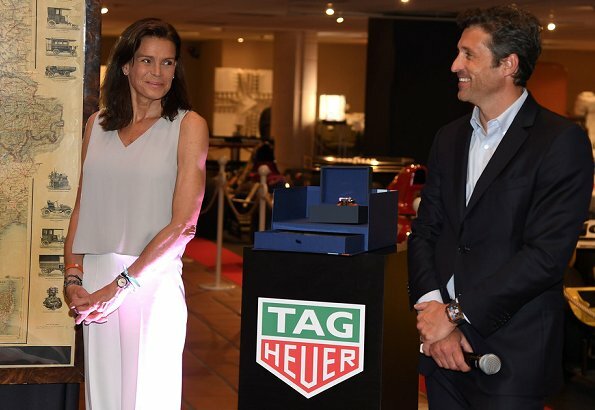 Patrick Dempsey and Princess Stephanie: lovely team here! Picture 3 is gorgeous! I like her. She seems to be down to earth but a very sensitive woman. Pss Stephany looks fantastic, her daughters and soon to be dau i Law's outfits look fine but a bit to short I would say. I'd love to know what the joke was that led to Patrick's smile and Stephanie flirtingly brushing her hair behind her ear! Pauline looks nice and tan. All the white dresses and healthy tans, an invitation to or advertisement for Monaco. 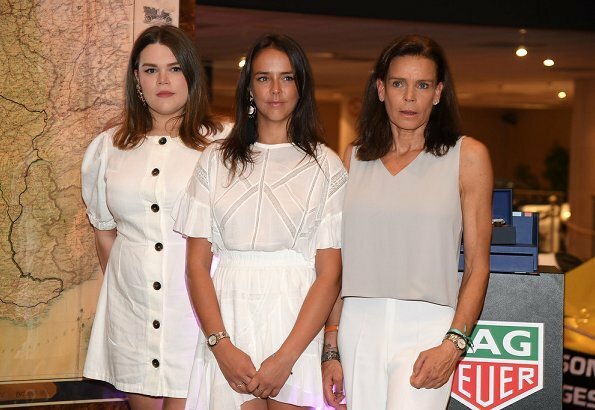 Pauline Ducruet looks so uncomfortable in her short skirt. That woman in white dress with black buttons...very ugly outfit that doesn't suit her and makes her look ridiculous. Stéphanie looks the best of them, casually elegant. 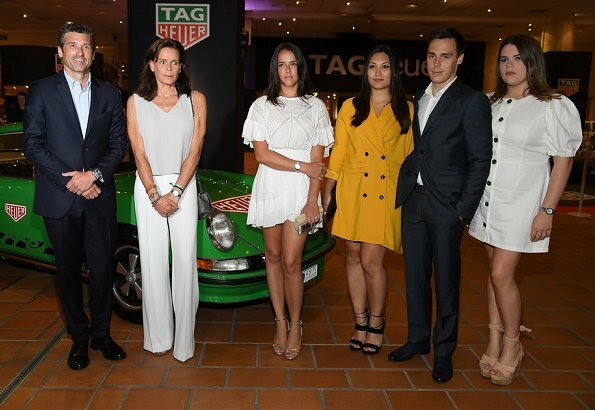 That woman in white dress with black buttons is Stephanies youngest daughter Camille Gottlieb. For me, it seems that Camille has loosing a bit weight. She has a very classical face. The dress makes her bigger in her shoulders than she is. The puffy half sleeve is only for very slim woman in my opinion. Dresses of the tree young ladies could have been a little bit longer otherwise they are young and it is still o.k. She always looks gaunt and masculine. That may be true, but isn't it good that there is much more than one way to a woman? Oops - more than one way to be a woman I wanted to say! Stéphanie, Pauline and Marie Chevallier look good! Attractive ladies! I've always liked Stéphanie, she is a free spirit. But also my impression is that Camille has to fight for self-confidence. I hope this is just my impression! Princess Stephanie of Monaco looks fabulous. Fashionwise I like Stéphanies outfit, the wide white pants look good on her and the light grey top is a a good choice with white, it looks plain and sophisticated. I would prefer it a few inches longer. But her facial expressions are weird as always. She always seems to be so uncomfortable in public, almost frightened, her facial features seem to freeze and shut down and lighten only up with a rare smile. Pauline's dress is way too short, although the dress is nice and suits her. But Camille's dress doesn't even suit her, the button on her chest is about to explode, it is too short and the big sleeves make herlook even bigger. The yellow dress of the other young lady has also a very bad cut. 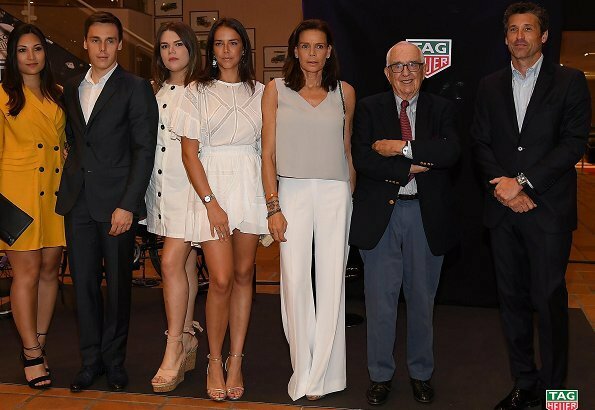 Must be difficult to get decent clothes in Monaco. And money obviously does not help. Beth, probably that is the reason why they invented online-shopping! But sadly there is no internet in Monaco...? Stephanie looks good. Very good in fact. The girls´ dresses could have all used another 10cm in length. Plus the yellow one needs a belt to mark the waist (in order to not look like a sack). Stephanie always looks so scared, anxious or angry. She rarely smiles in any photos you see of her.Pity because she has such a nice smile. I like her outfit but for me the pant legs are too wide. Camille's dress does her no favours especially the top half. She appears to be a bit top heavy and those puffy sleeves just add too much bulk to that area. Stephanie heeft het goed gedaan, de kinderen zijn heel gek met hun moeder !!! I think comments about fashion are appropriate here, but not about body shapes/sizes as those are risky at best and actually harmful many times. A big NO for all 3 young women, way too short dresses, especially on Pauline, and Camille's and Marie's dresses are downright ugly. Love this family - they are so close and supportive of each other. Stephanie's outfit looks nice - like the colours and cut, her hair looks in better condition than it has for a while. However, she's obviously had some work done on her face and it's bad. Pauline looks nice and I would like Marie's dress to be more fitted. I think Camille is very attractive and striking looking but this isn't the best dress for her although I think the white looks good. I really like Stephanie's outfit, the wide leg pants are elegant and very fluid, I also like the combination with the silky taupe top, and OMG!! The best accessorie is McDreamy next to her, YES!! Neither one of the three young ladies hit the mark this time, enough said.